Many cheap and cheerful eateries in Japan have a system whereby you place your order at a vending machine outside the door, then present the wait staff with your meal ticket when you enter. You’ll likely see these places around train and bus stations, or other areas where workers want a quick bite. Many of the vending machines are not that accessible to foreigners if you don’t understand Japanese script, but hunt around and you will see some have an “English” button or a button with an American flag on it: hit this, and you’re in. Feed your money in first before you choose the dishes you want to order, then find the button that looks like it will complete your transaction – it is often down near the money slot. In the photo above it’s the green and black button near the bottom. You will get change and a little paper slip with your order on it. If you are struggling to use the machine, wait until somebody else comes up and watch their process – the food is usually shown in pictures so you should be able to work it out. Pop inside, take a seat or find a standing space, and your food will be served pretty quickly. 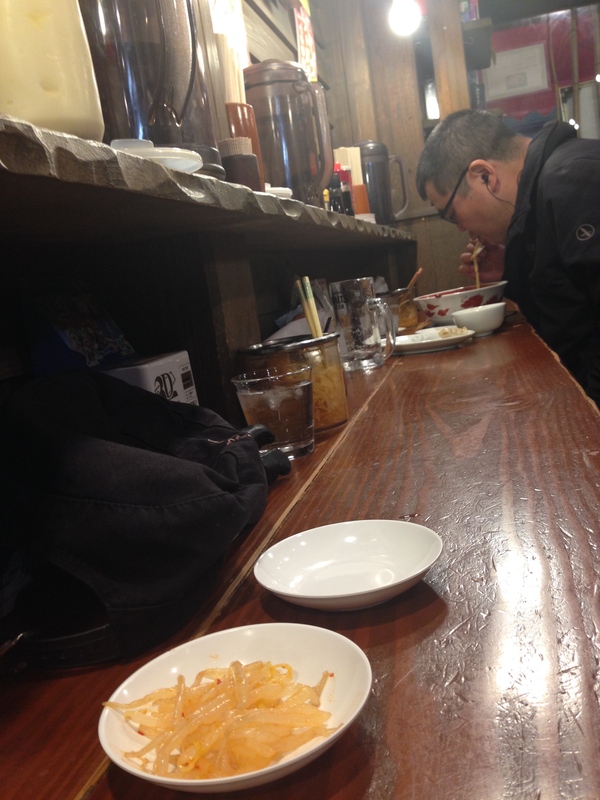 You’ll find simple seating with the usual condiments and disposable chopsticks. 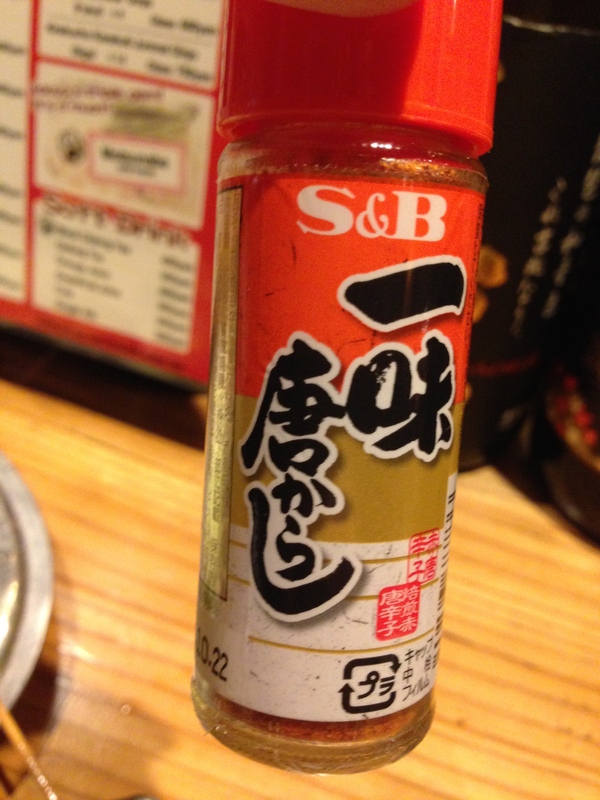 The photo below shows dumpling vinegar on the far right and soy sauce next in line – note how the Japanese characters differ for future reference! Hairbands are often helpfully supplied to keep your mane out of your ramen. As well as the usual noodle soups and “sets” (whatever you want with a bowl of rice and some miso soup), you’ll find beef or pork on rice, fried gyoza (usually pork) and other dishes. Add an egg to your rice or noodles for some extra richness – my favourite touch. The pork rice and gyoza below cost a princely 500 yen (around US$4). You can usually get more rice or noodles for around 100 yen. And if it’s all a little too bland you can always reach for the pickled ginger or the ubiquitous shichimi to heat things up!